Mathematical constructions can certainly have their aesthetic appeal, and the colour diagram which we show here is no exception. 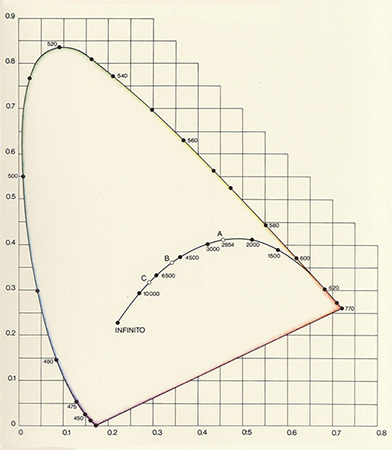 This type of diagram is also known as a «Standard Colour Table» or «Standard Valency System» and meets the requirements of some professionals for precision and objectivity. We are already familiar with a few systems (Munsell and Ostwald) which are able to specify colours exactly. For this purpose, a set of colour samples is needed. If such systems are to be used for colour measurement (colorimetry), a few problems will arise, however. The quantification of either a sample or a light source against a standard remains a very subjective procedure. The samples used for such a comparison can also fade with time, making them unreliable. In the early 20th century, the wish for an objective method of determining colours to overcome this weakness became increasingly apparent. 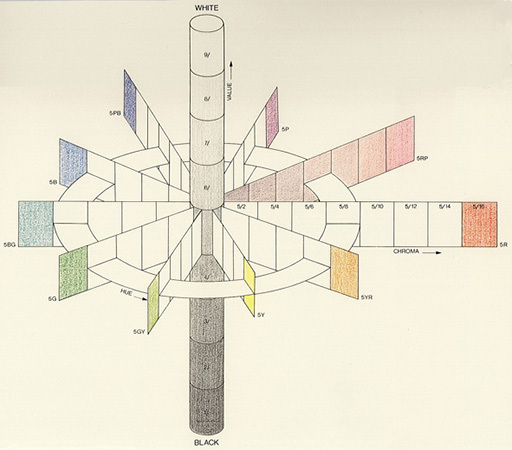 A colour system was required without the need for samples, so the CIE («Commission International d’Eclairage») was engaged to produce a «Colour Standard Table». The result has been available since 1931 and has without doubt stood the test of time. 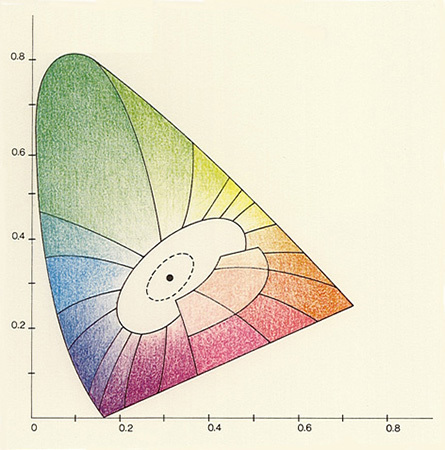 The CIE chromatic diagram, which can be compared with a horse shoe or the shape of a tongue, has a pedigree that goes back to Maxwell’s colour measurements and the construction of his triangle. The CIE adopted these measured colour matching functions — but not without first giving them a mathematical tweak so that only positive values would arise for the new colour matches. This certainly proved advantageous when making calculations, but caused a lack of clarity in the reference values used. While the old Maxwellian trichromatic values R, G and B could still be related to primary colours, this was no longer possible with the CIE’s new «tristimulus values» of X, Y and Z (in spite of the choice being such that white is represented by equal values for X, Y and Z). Nevertheless, they can still be converted in the same way as Maxwell had done, and this will result in the colour-table shown. The CIE wished to promote the study of colours using a colour-map similar to the way the study of geography is simplified by using two dimensional maps. In order, therefore, to omit one dimension, three new variables x, y and z (colour-masses) were derived from the three measured values of X, Y and Z by dividing each of these numbers by their total sum: x = X/(X + Y + Z) and so forth. With this conversion, it is important that the sums of the colour-masses add up to one (x + y + z = 1). Only two of the new values thus remain independent, and these can be shown on a two-dimensional chart (a map, in fact). The CIE diagram does just this: the horizontal axis represents the values for x, and the vertical axis the values for y. The chromaticity diagram shown will result if a line is drawn through the points which plot the positions of the converted tristimulus values relating to the various specified wavelengths. Since the range of wavelengths between 770 nm and 450 nm is concerned with the spectral colours, we also call these positions «spectrum loci». If spectral light with a wavelength of 400 nm (left-hand edge intersection) is mixed with light of 770 nm (right-hand end point), we can see that all resulting colours must lie on the line which connects these two points. By plotting this, the so-called purple line will result, to complete the diagram. Although the CIE diagram is based on the ability of the human eye to match colours, it is a mathematical construction all the same, with the advantage that the position of each colour in relation to each of the primary colours can be calculated — indeed independently from any particular source of illumination. 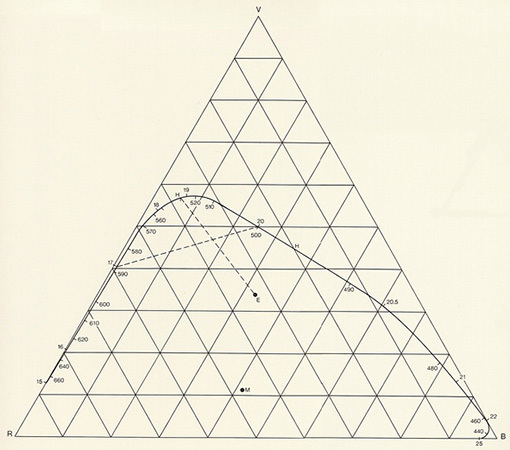 The chromaticity diagram also gains significance because all existing colours must lie within the tongue shape delineated by both the above-mentioned lines. The light sources A, B and C must first be specified, however. They are located on a curve which is marked with digits. These digits represent temperatures based on a law of physics which states that light radiating from a black-body — a colour therefore — is linked with its temperature. If, for example, glowing coal or boiling steel are subjected to further heating, their colour will change. Colours and temperature are interrelated; physics will state that the midday light of the sun has a value of 4870° Kelvin and a typical lamp perhaps 2854° K. The light of the rising sun is approximately 1800° K in warmth (Kelvin is the unit of value on the absolute temperature scale. 0° Kelvin (absolute zero) = -273.16 °C). 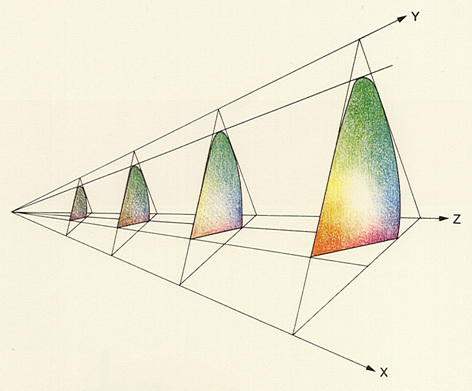 The CIE diagram is only one plane within a colour-space which records the sensation of light. Other planes represent colours of lessening brightness: in other words, the respective diagrams show how colours will appear when there is less light. This projection of the spectrum loci and purple lines to the zero point will result in an attractive construction referred to as a «colour-bag» in the sober world of colorimetry. In addition to the measurement of colour, the CIE diagram can also be used to name colours. The division shown below and to the right originates with Kenneth L. Kelly, who had proposed a name for each zone. The largest zone (above left) accommodates green, while red (below right) occupies only a small area opposite. (This non-uniform division of space is, incidentally, often seen as a disadvantage of the CIE diagram.) The oval surface around the centre remains empty of any particular allocation of names, and the standard light sources such as ‘C’ (see above) lie inside the dotted line. The CIE diagram can also assume many other functions: as a kind of colour-circle, it permits the fixing of complementary colours which, in additive mixtures, produce either white or grey; it also enables the prediction of colours obtained by mixing light. It has served colorimetry well during the past fifty years or more. Perhaps we, too, should become familiar with it. Date: The so-called “Colour Standard Table” of the “Commission International d’Eclairage” has existed since 1931. Related systems: Maxwell — Helmholtz — Munsell — Ostwald — Luther & Nyberg — CIE-Rösch — CIE-MacAdam — DIN — Coloroid — C.I.E.L.A.B. 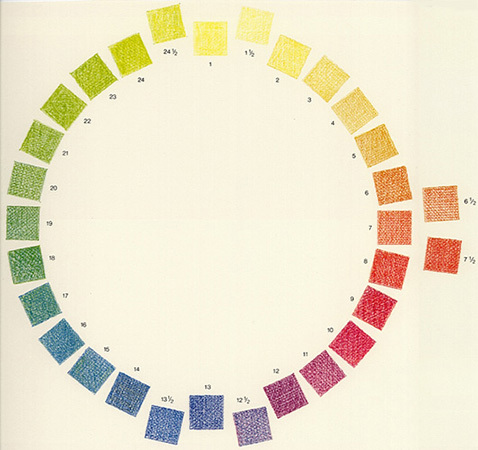 Bibliography: G. Wyszecki und W. S. Stiles, «Color Science», New York 1967; D. B. Judd und G. Wyszecki, «Color in Business, Science, and Industry», New York 1975; G. A. Agoston, «Color Theory and Its Application in Art and Design», Heidelberg 1979.